The Central Lakes Cycle David Grotberg Memorial 5k"ish will be held on Sat. September 22, 2018. The course will be run on the same run course as the 24/7. 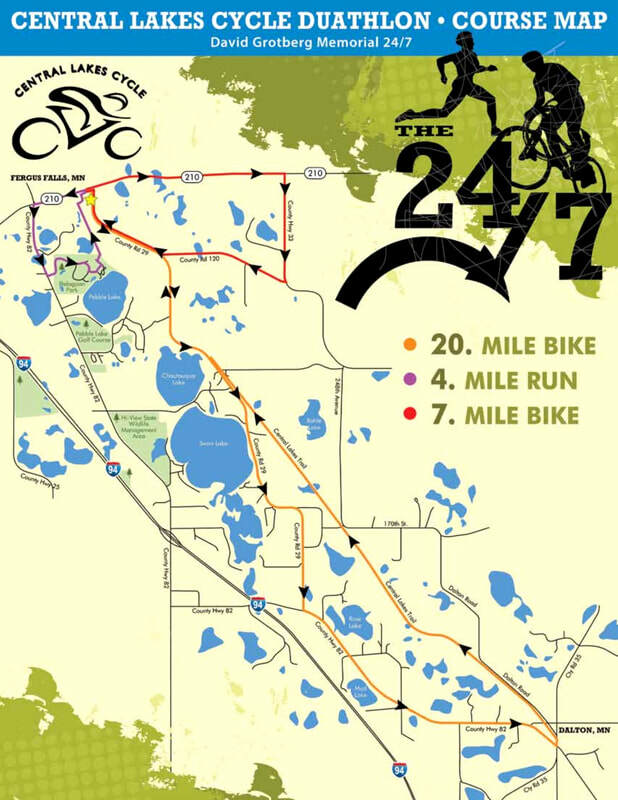 The Central Lakes Cycle 5k"ish" will be held at Central Lakes Cycle 2010 State Highway 210 East Fergus Falls MN, 56537. We are located just east of the scenic Central Lakes Trail trail head. The course offers a beautiful ride through rolling hills as well as a nice flat competitive stretch on the trail. Registration is now open! Click the Zap button to register today! The 5k"ish" will be chip timed by Pickle Events. Chips from relay teams must be returned to volunteers at the finish line. There will be a fee of $30 for non-returned chips. PACKET PICK UP AND RACE DAY REGISTRATION START AT 6:30 A.M. RACE STARTS AT 8:00 A.M. The race will be a time trial start and will start from the northeast corner of our parking lot. There will be water stops throughout the course. Post race refreshments will be available to all participants. If you are up for a challenge or just want to enjoy nature at its finest; reserve your spot on the starting line today!